Chris Noronha, President has 37 Years Business experience in the Healthcare & Technology Industries. He has a Bachelors in Engineering and an MBA from Washington University in St Louis. Specialties include System integration, Project and Risk management,developing Project metrics and Data Analytics. 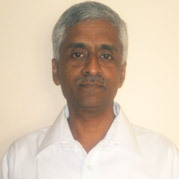 Mr. Giridharan Vaidyanathan , Co -President, has 32 Years experience in Health- IT. He pioneered the use of Telemedicine since 1998 with projects implemented in India, Asia, Africa and the Middle East which have processed 150,000 Patients . He has a Bachelors in Engineering. His expertise is in developing products for the healthcare industry including Hospital Information System, Medical Imaging, Telemedicine, Patient Clinical and Health Records, and Clinical Decision Support Systems. These products are established and operating in South East Asia, The Middle East, India and Africa, at over 200 hospitals, clinics and diagnostic centers.. Furnished below are web Links to News Stories on IDG carried in the press.